If a Virgin broadband & VOIP customer would like to come across to Exetel for their broadband and VOIP and keep their existing VOIP number that they have with Virgin - is that possible? There is no landline available. Thanks that is the info I need. Also if you get the prepaid wireless broadband through members facilities can it be just a one off - it isn't really that clear on the order form, Wiki FAQS,or billing. Do I click yes or no? Would Exetel consider having a Live Chat for support and assistance? Hi Just wondering as I am now on the new NBN fibre service can I take part in a referral bonus? With regards to our VOIP service and the fibre, do you know how long before we can use the ONT UNI V1 and UNI V2? months or years? 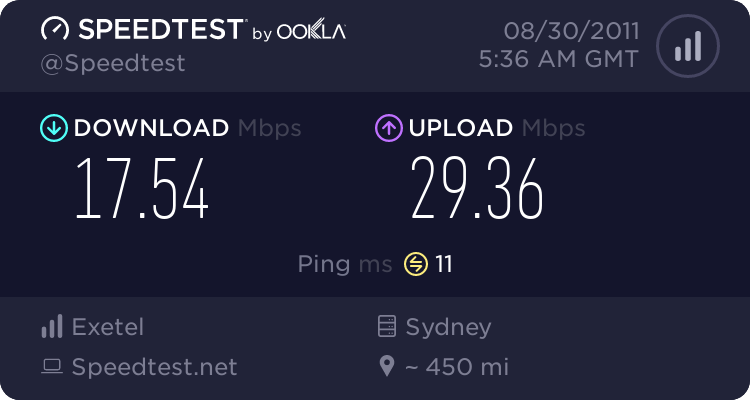 Could an exetel staff member, please check my speed. This is obviously not correct.